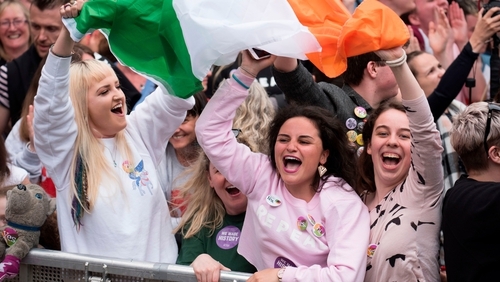 Ireland has voted decisively to change the constitution to repeal the Eighth Amendment, paving the way for new legislation to allow for the termination of pregnancies. The historic result, declared at Dublin Castle this evening, put the Yes vote at 66.4% with 33.6% voting No. Just one constituency, Donegal, rejected the proposal. The country voted to repeal the Eighth Amendment by a majority of 706,349 votes, referendum returning officer Barry Ryan announced just after 6pm this evening. The Eighth Amendment which was inserted into the constitution in 1983 recognised the equal right to life of the mother and the unborn, and limited the circumstances whereby abortions could be carried out. "Today is an historic day for Ireland. A quiet revolution has taken place, and a great act of democracy," said Taoiseach Leo Varadkar at Dublin Castle. Today's result will allow the Government to legislate for the termination of pregnancies. From early on the Yes vote never looked in doubt, with tallies confirming the results of two exit polls which showed a landslide victory for the Yes side. All of the electoral constituencies in Dublin returned a Yes vote in excess of 70%. The highest of which was Dublin Bay South where 78% of people voted for a repeal. Dublin West, home to Taoiseach Leo Varadkar, voted Yes by almost 75%. In Cork, the two city constituencies also returned decisive Yes votes, with Cork South Central, the constituency of the Tánaiste Simon Coveney and Fianna Fáil leader Micheál Martin, voting repeal by almost 69%. Across the country the majority of constituencies returned an emphatic Yes vote, with only Donegal bucking the national trend, voting No by 51.87% while 48.13% of people voted Yes. Wicklow, the constituency of Health Minister Simon Harris returned a Yes vote of 74%, while in Carlow-Kilkenny where just one TD (from Sinn Féin) supported the Government's position on abortion, the people voted 64% for Yes to 36% for No. In Kerry, home of high profile No-vote campaigners the Healy-Rae brothers, 58% of people voted Yes, while in Tipperary, the constituency of Mattie McGrath - another prominent No campaigner, people voted by 59% in favour of repeal. Over 1.4 million people voted Yes to the proposal.